Note: As of June 15, 2014, this branch is already closed. It pays to be early, as proven by the jaw-dropping Maroon 5 Overexposed Concert Tour last September 18, 2012 at the SMART Araneta Coliseum. Unlike the Katy Perry concert where we got the tickets the day before the concert, we got our Maroon 5 concert tickets the first week they started selling. At around 8:15pm, the concert's front act, The Cab, starting playing. The Cab played 3 to 4 songs, none of them familiar to me (hahaha, sorry I just don't know the band). 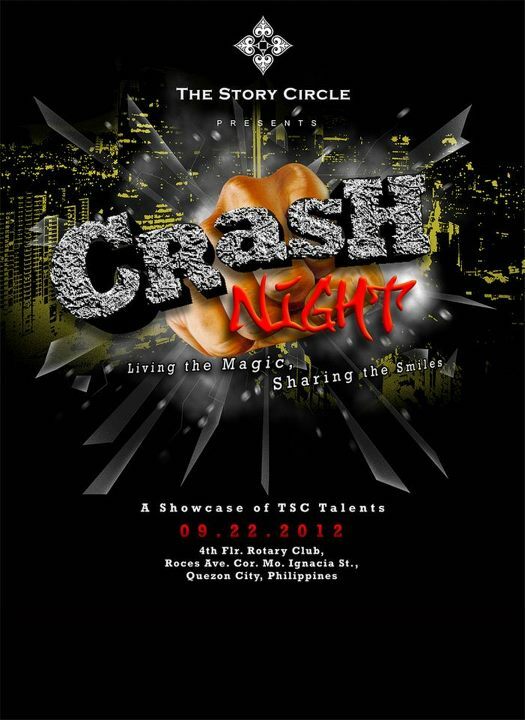 The Story Circle, a community for magic in the Philippines, is inviting you to witness a night full of magic entitled: Crash Night: Living the Magic, Sharing the Smiles. 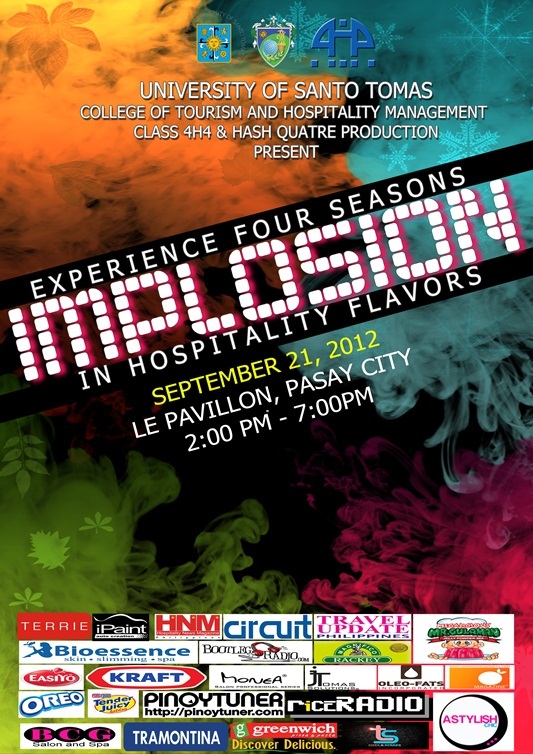 UST College of Tourism and Hospitality Management and Hash Quatre Productions cordially invite you to attend the most flavorful event of the season entitled: IMPLOSION: Experience Four Seasons in Hospitality Flavors. Be the winner of Php 1000 worth of King Bee GCs!!! After our sumptous lunch at Harbour City, we looked around Ayala to have dessert. No better place will we ever get satisfy our sweet tooth than The Dessert Factory. Julie's Bakeshop brings a lot of memories, especially during my college years. I would drop by Julie's Bakeshop to buy my favorites, like the Cheese Streusel, Cheesy cheese bread, and Ensaymada Monggo to share with friends in between breaks. :) Of course, who wouldn't love Pan de Sal, Spanish bread and the loafs? Julie's has been a part of the Filipino household for more than 30 years, serving quality breads to almost every part of the country. My friend and I recently tried one of the newest restos near the office: Kangaroo Jack. I was always curious about this place and with the tagline "Steaks, Grillers, and Sizzlers", I knew I shouldn't delay my visit. I love eating on sizzling plates that it doesn't matter if I burn my tongue. During high school, I used to order a sizzling chicken or sizzling pork chop for recess. Yes, that's for recess, lunch is a different meal (those were the days when I can eat anything and not even gain an ounce). Since the place was named after an animal from Australia, the place was decorated with Aborigine-inspired displays. A picture of a kangaroo was also painted in the ceiling. I’m a huge fan of online shopping because you can find savings online that you just can’t find in store. No matter what type of product or service you want to buy, I can almost guarantee that the best price will be found somewhere on the interest. And the reason isn’t just competition, but that there are so many different ways to get discounts and savings. Here are some simple ways to save online. I'm currently running a giveaway! Throughout my entire trip to Cebu, Harbour City is the only resto we visited twice because the food was really addicting! This post will be a combination of my two visits in this awesome place! I've first learned about this place from Richie, who loves (worships, obsesses, venerates) Harbour City. I've been to Cebu before but I haven't tried this place. Harbour City belongs to a Cebu-based restaurant chain which also owns Ding Qua Qua and Dimsum Break (it's quickserve chain). Win King Bee Chinese Food GCs worth Php 1000!!! I'm a huge fan of Katy Perry. I watched her California Dreams Tour: Live in Manila last January. I also have her "Teenage Dream" CD. I love that she writes her own songs (like Adele and Maroon 5). Katy is such a darling that even little girls like her, including my little sister, who knows the lyrics of her songs. It's time to be with our loved ones to celebrate and give thanks. I'll be giving away King Bee Chinese Food GCs worth Php 1000 to one (1) lucky winner! Enjoy eating delicious dimsum and other authentic Chinese dishes with your family and friends!